Notes | In the heat of battle, in the devastated countryside, among troops and civilians equally hurt by the savagery of war, Larry Burrows photographed the conflict in Vietnam from 1962, the earliest days of American involvement, until 1971, when he died in a helicopter shot down on the Vietnam–Laos border. His images, published in Life magazine, brought the war home, scorching the consciousness of the public and inspiring much of the anti-war sentiment that convulsed American society in the 1960s. 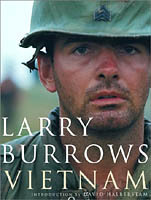 To see these photo essays today, gathered in one volume and augmented by unpublished images from the Burrows archive, is to experience (or to relive), with extraordinary immediacy, both the war itself and the effect and range of Larry Burrows’s gifts—his courage: to shoot “The Air War,” he strapped himself and his camera to the open doorway of a plane . . . his reporter’s instinct: accompanying the mission of the helicopter Yankee Papa 13, he captured the transformation of a young marine crew chief experiencing the death of fellow marines . . . and his compassion: in “Operation Prairie” and “A Degree of Disillusion” he published profoundly affecting images of exhausted, bloodied troops and maimed Vietnamese children, both wounded, physically and psychologically, by the ever-escalating war. Larry Burrows (1926–71) was born in England, went to work at the age of sixteen in the photo lab of Life’s London bureau, and rose to become one of the twentieth century’s greatest photojournalists. David Halberstam, Burrows’s close friend and comrade in Vietnam, is the author of many books, most recently War in a Time of Peace: Bush, Clinton, and the Generals. He lives in New York City. Comments | [12/09/06] Came across this book when I was in London and couldn't put it down. By far my favorite photographer of all times. There is just something with his pictures, aside from composition and beautiful color, the images are amazing and I recommend everyone at least to thumb through it. Comments | [02/09/06] A comprehensive look at some of the last and best work by Larry Burrows. You could easily spend more than the cost of this book trying to get your hands on the Life magazines that his works on Vietnam were printed in and still not have as comprehensive a collection of images from one of the best photographers to cover Vietnam, or any war for that matter. Don't be cheap... buy the hardcover version for the superior printing quality over the cheaper version. Comments | [12/24/04] I have compassionate photographer, and based on it this book is definitely next on my list. Comments | [12/22/04] A beautiful and haunting tribute to one of the best war photographers that ever lived. Brilliant!! Comments | [07/13/04] Burrows is my favorite photographer and this is an outstanding collection of his war work. Comments | [05/31/03] Burrows was an amazing photographer. His earlier book,The Compassionate Photographer, is long out of date, so this title is the next best thing. A must read.